According to Vedic civilization, unmarried girls from ten to fourteen years of age are supposed to worship either Lord Siva or the goddess Durga in order to get a nice husband. 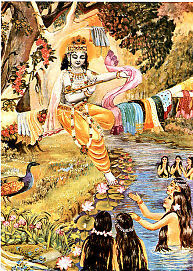 But the unmarried girls of Vrndavana were already attracted by the beauty of Krishna. They were, however, engaged in the worship of the goddess Durga in the beginning of the hemanta season (just prior to the winter season). The first month of hemanta is called Agrahayana (October-November), and at that time all the unmarried gopis of Vrndavana began to worship goddess Durga with a vow. They first ate havisyanna, a kind of foodstuff prepared by boiling together mung dhal and rice without any spices or turmeric. According to Vedic injunction, this kind of foodstuff is recommended to purify the body before one enacts a ritualistic ceremony. All the unmarried gopis in Vrndavana used to daily worship goddess Katyayani early in the morning after taking bath in the river Yamuna. Katyayani is another name for goddess Durga. The goddess is worshiped by preparing a doll made out of sand mixed with earth from the bank of the Yamuna. It is recommended in the Vedic scriptures that a deity may be made from different kinds of material elements; it can be painted, made of metal, made of jewels, made of wood, earth or stone or can be conceived within the heart of the worshiper. The Mayavadi philosopher takes all these forms of the deity to be imaginary, but actually they are accepted in the Vedic literatures to be identical with either the Supreme Lord or a respective demigod. The unmarried gopis used to prepare the deity of goddess Durga and worship it with candana pulp, garlands, incense lamps and all kinds of presentations--fruits, grains and twigs of plants. After worshiping, it is the custom to pray for some benediction. The unmarried girls used to pray with great devotion to goddess Katyayani, addressing her as follows: "O supreme eternal energy of the Personality of Godhead, O supreme mystic power, O supreme controller of this material world, O goddess, please be kind to us and arrange for our marriage with the son of Nanda Maharaja, Krishna." The Vaisnavas generally do not worship any demigods. Srila Narottama dasa Thakura has strictly forbidden all worship of the demigods for anyone who wants to advance in pure devotional service. Yet the gopis, who are beyond compare in their affection for Krishna, were seen to worship Durga. The worshipers of demigods also sometimes mention that the gopis also worshiped goddess Durga, but we must understand the purpose of the gopis. Generally, people worship goddess Durga for some material benediction. Here, the gopis prayed to the goddess to become wives of Lord Krishna. The purport is that if Krishna is the center of activity, a devotee can adopt any means to achieve that goal. 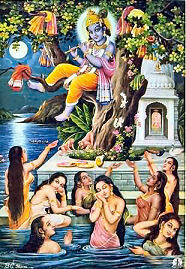 The gopis could adopt any means to satisfy or serve Krishna. That was the superexcellent characteristic of the gopis. They worshiped goddess Durga completely for one month in order to have Krishna as their husband. Every day they prayed for Krishna, the son of Nanda Maharaja, to become their husband. 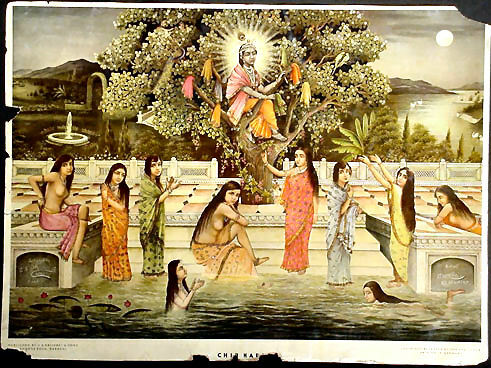 Early in the morning, the gopis used to go to the bank of the Yamuna to take bath. They would assemble together, capturing each other's hands, and loudly sing of the wonderful pastimes of Krishna. It is an old system among Indian girls and women that when they take bath in the river they place their garments on the bank and dip into the water completely naked. The portion of the river where the girls and women take bath was strictly prohibited to any male member, and this is still the system. The Supreme Personality of Godhead, knowing the minds of the unmarried young gopis, benedicted them with their desired objective. They had prayed for Krishna to become their husband, and Krishna wanted to fulfill their desires. At the end of the month, Krishna, along with His friends, appeared on the scene. Another name of Krishna is Yogesvara, or master of all mystic powers. By practicing meditation, the yogi can study the psychic movement of other men, and certainly Krishna could understand the desire of the gopis. 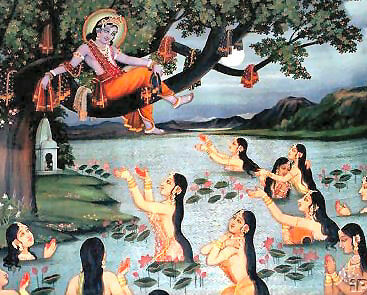 Appearing on the scene, Krishna immediately collected all the garments of the gopis, climbed up in a nearby tree, and with smiling face began to speak to them. "My dear girls," He said. "Please come here one after another and pray for your garments and then take them away. I'm not joking with you. I'm just telling the truth. I have no desire to play any joke with you, for you have observed the regulative principles for one month by worshiping goddess Katyayani. Please do not come here all at once. Come alone; I want to see each of you in your complete beauty, for you all have thin waists. I have requested you to come alone. Now please comply." When the girls in the water heard such joking words from Krishna, they began to look at one another and smile. They were very joyous to hear such a request from Krishna because they were already in love with Him. Out of shyness, they looked at one another, but they could not come out of the water because they were naked. Due to remaining in the water for a long time, they felt cold and were shivering, yet upon hearing the pleasing and joking words of Govinda, their minds were perturbed with great joy. They began to tell Krishna, "Dear son of Nanda Maharaja, please do not joke with us in that way. It is completely unjust to us. You are a very respectable boy because You are the son of Nanda Maharaja, and You are very dear to us, but You should not play this joke on us because now we are all shivering from the cold water. Kindly deliver our garments immediately, otherwise we shall suffer." They then began to appeal to Krishna with great submission. "Dear Syamasundara," they said, "we are all Your eternal servitors. Whatever You order us to do, we are obliged to perform without hesitation because we consider it our religious duty. But if You insist on putting this proposal to us, which is impossible to perform, then certainly we will have to go to Nanda Maharaja and lodge a complaint against You. If Nanda Maharaja does not take action, then we shall tell King Kamsa about Your misbehavior." Upon hearing this appeal by the unmarried gopis, Krishna answered, "My dear girls, if you think that you are My eternal servitors and you are always ready to execute My order, then My request is that, with your smiling faces, you please come here alone, one after another, and take away your garments. If you do not come here, however, and if you lodge complaints to My father, I shall not care anyway, for I know My father is old and cannot take any action against Me." When the gopis saw that Krishna was strong and determined, they had no alternative but to abide by His order. One after another they came out of the water, but because they were completely naked, they tried to cover their nakedness by placing their left hand over their pubic area. In that posture they were all shivering. Their simple presentation was so pure that Lord Krishna immediately became pleased with them. All the unmarried gopis who prayed to Katyayani to have Krishna as their husband were thus satisfied. A woman cannot be naked before any male except her husband. The unmarried gopis desired Krishna as their husband, and He fulfilled their desire in this way. Being pleased with them, He took their garments on His shoulder and began to speak as follows. 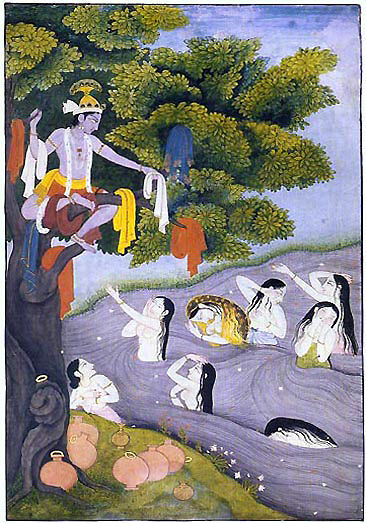 "My dear girls, you have committed a great offense by going naked in the river Yamuna. Because of this, the predominating deity of the Yamuna, Varunadeva, has become displeased with you. Please, therefore, just touch your foreheads with folded palms and bow down before the demigod Varuna in order to be excused from this offensive act." The gopis were all simple souls, and whatever Krishna said they took to be true. In order to be freed from the wrath of Varunadeva, as well as to fulfill the desired end of their vows and ultimately to please their worshipable Lord, Krishna, they immediately abided by His order. Thus they became the greatest lovers of Krishna, and His most obedient servitors. Nothing can compare to the Krishna consciousness of the gopis. Actually, the gopis did not care for Varuna or any other demigod; they only wanted to satisfy Krishna. Krishna became very ingratiated and satisfied by the simple dealings of the gopis, and He immediately delivered their respective garments, one after another. Although Krishna cheated the young unmarried gopis and made them stand naked before Him and enjoyed joking words with them, and although He treated them just like dolls and stole their garments, they were still pleased with Him and never lodged complaints against Him. This attitude of the gopis is described by Lord Caitanya Mahaprabhu when He prays, "My dear Lord Krishna, You may embrace Me or trample Me under Your feet, or You may make Me brokenhearted by never being present before Me. Whatever You like, You can do, because You have complete freedom to act. But in spite of all Your dealings, You are My Lord eternally, and I have no other worshipable object." This is the attitude of the gopis toward Krishna. Lord Krishna was pleased with them, and since they all desired to have Him as their husband, He told them, "My dear well-behaved girls, I know of your desire for Me and why you worshiped goddess Katyayani, and I completely approve of your action. Anyone whose full consciousness is always absorbed in Me, even if in lust, is elevated. As a fried seed cannot fructify, so any desire in connection with My loving service cannot produce any fruitive result, as in ordinary karma." There is a statement in the Brahma-samhita: karmani nirdahati kintu ca bhakti-bhajam. Everyone is bound by his fruitive activities, but the devotees, because they work completely for the satisfaction of the Lord, suffer no reactions. Similarly, the gopis' attitude toward Krishna, although seemingly lusty, should not be considered to be like the lusty desires of ordinary women. The reason is explained by Krishna Himself. Activities in devotional service to Krishna are transcendental to any fruitive result. "My dear gopis," Krishna continued, "your desire to have Me as your husband will be fulfilled because with this desire you have worshiped goddess Katyayani. I promise you that during the next autumn season you shall be able to meet with Me, and you shall enjoy Me as your husband." Taking shelter of the shade of the trees, Krishna became very happy. While walking He began to address the inhabitants of Vrndavana. "My dear Stoka Krishna, My dear Varuthapa, My dear Bhadrasena, My dear Sudama, My dear Subala, My dear Arjuna, My dear Visala, My dear Risabha--just look at these most fortunate trees of Vrndavana. They have dedicated their lives to the welfare of others. Individually they are tolerating all kinds of natural disturbances, such as hurricanes, torrents of rain, scorching heat and piercing cold, but they are very careful to relieve our fatigues and give us shelter. My dear friends, I think they are glorified in this birth as trees. They are so careful to give shelter to others that they are like noble, highly elevated charitable men who never deny charity to one who approaches them. No one is denied shelter by these trees. They supply various kinds of facilities to human society, such as leaves, flowers, fruit, shade, roots, bark, flavor extracts and fuel. They are the perfect example of noble life. They are like a noble person who has sacrificed everything possible--his body, mind, activities, intelligence and words--in engaging in the welfare of all living entities." Thus the Supreme Personality of Godhead walked on the bank of the Yamuna, touching the leaves of the trees and their fruits, flowers and twigs, and praising their glorious welfare activities. Different people may accept certain welfare activities to be beneficial for human society, according to their own views, but the welfare activity that can be rendered to people in general, for eternal benefit, is the spreading of the Krishna consciousness movement. Everyone should be prepared to propagate this movement. As instructed by Lord Caitanya, one should be humbler than the grass on the ground and more tolerant than the tree. The tolerance of the trees is explained by Lord Krishna Himself, and those who are engaged in the preaching of Krishna consciousness should learn lessons from the teachings of Lord Krishna and Lord Caitanya through Their direct disciplic succession. While passing through the forest of Vrndavana on the bank of the Yamuna, Krishna sat down at a beautiful spot and allowed the cows to drink the cold and transparent water of the Yamuna. Being fatigued, the cowherd boys, Krishna and Balarama also drank. 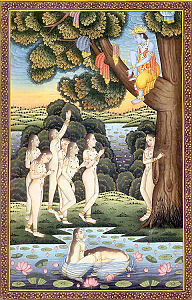 After seeing the young gopis taking bath in the Yamuna, Krishna passed the rest of the morning with the boys. "Stealing the Garments of the Unmarried Gopi Girls."